Worker co-operatives in post apartheid South Africa have all too often been championed by certain sections of the labour movement and some on the left as part of the solution to the ‘structural unemployment’ facing the popular classes in the current dispensation. Moreover, and often framed in purely ideological, often Proudhonist terms (in particular from the SACP and from various ex SACP members); worker co-operatives are understood as an equitable way of organizing production so that workers have control over the labour process, on the one hand, and ownership of the means of production, on the other. Certain ‘enabling’ legislation and policy such as the Co-operatives Act of 2005, the National Co-operatives Policy of 2007 and the national Department of Trade and Industry (DTI) stepping in as the ‘custodian’ of co-operative development South Africa has, at least on paper, meant that co-operatives are part of the national development agenda currently embodied by the New Growth Plan (NGP) policy framework. However, if one does some research into how various co-operative development projects, including trade union, state initiated, and community initiated and worker occupation-type co-operatives have fared in the post-apartheid era, one would see the dismal performance of these co-operatives in relation to their original objectives. These are, in particular, providing sustainable employment for their members while at the same time maintaining member control and popular participation in administration and production. This article seeks to tease out some of the pitfalls of organizing worker co-operatives trying to compete in the market and often with the ‘assistance’ of the state. The benefits and limitations of co-operatives have long been the topic of discussion amongst anarchists and other libertarian socialists. This paper draws on the ideas of Bakunin (as against Proudhon) around the question of how co-operatives relate to and are affected by the state and the market in capitalist society. It subsequently evaluates the realities faced by co-operatives operating in the market through an analysis of ‘worker control’ and ‘social ownership’ in the former Yugoslavian co-operatives and ‘degeneration of worker control’ in the Mondragon Co-operative Complex in Spain. We then move onto the Ekurhuleni Metropolitan Municipality’s state sponsored co-operative development project as the South African case study. “The various forms of co-operation are incontestably one of the most equitable and rational ways of organizing the future system of production. But before it can realize its aim of emancipating the labouring masses so that they will receive the full product of their labour, the land and all forms of capital must he converted into collective property. As long as this is not accomplished, the cooperatives will be overwhelmed by the all-powerful competition of monopoly capital and vast landed property; … and even in the unlikely event that a small group of cooperatives should somehow surmount the competition, their success would only beget a new class of prosperous co-operators in the midst of a poverty-stricken mass of proletarians”. “1) paternalism, 2) the absorption of the individual by the Mir, 3) confidence in the tsar… the only masters he recognises are the tsar and the Mir”. For Bakunin, the co-operative (or here Mir) is parochially and patrimonially tied to the tsar and in turn the state; based upon the belief that the state is the ultimate guarantor of the Mir’s survival. He also argues that the relationship between individual workers and the co-operative (or Mir) is such that the co-operator is dependent on the Mir for his or her own survival, that is, the co-operative provides for the material needs of the peasantry. This is also true too for worker co-operatives in the market, competing with capitalist firms, and of co-operatives who receive funding in the form of start up capital from the state, as will be shown in the case studies. Pierre Proudhon (1809-1865), on the other hand, championed self-management of the means of production in the productive sphere and mutualism in the sphere of allocation, distribution and consumption, as the key constituents of the future socialist society, but that these ought to be peacefully built under capitalism. In Proudhon’s reckoning, mutualism, and indeed the development of a non-capitalist ‘third’ sector- the co-operative sector – are not at odds with the market. In fact, the market is understood as the principle means by which the non-capitalist sector, that is, the co-operative sector (or free federation, in Proudhon’s words) can gradually chip away at the edifice of capitalism; that is private property and individual ownership of the means of production. Mutualism disregarded the necessity for doing away with private property and private profits, so long as distribution occurred according to effort, and within the free federation of co-operatives. This is not to suggest, however that the market is unable to do this, rather, the market is the chief mechanism ensuring that goods and services are distributed and allocated along ‘mutualistic’ lines. While co-operatives are understood by Bakunin as providing valuable practical experience of self-management, he insisted, however, that worker co-operatives would never be able to compete with big business and the “oligarchic monopoly” of industrial and commercial bankers. This is due to the fact that co-operatives set up by workers, due to their limited access to resources, would never be able to develop or maintain the necessary economy of scale in production to ever be able to compete successfully in the long run with capitalist firms. Even if enough capital resources were somehow raised by workers, or if the state or a trade union stepped in to help, and a co-operative was ‘successfully’ competing in the market, participation and worker control would disintegrate toward hierarchy and managerialism- the hallmarks of the capitalist enterprise. Although Proudhon was necessarily suspicious of the state, and argued that the state should not interfere in the free federation, Proudhon’s critique, and indeed critical understanding of capitalism, ignored the prospect of monopoly capital overrunning and deforming the free federation and the vested interests of the state in maintaining the capitalist class structure. This was in turn a critical weakness in Proudhon’s understanding of social change: that capitalists and those holding onto state power would give up their gains easily, even if overrun by the co-operatives. On the contrary, Bakunin suggested that the capitalist sector would overrun the non-capitalist one, forcing the co-operatives through the pressures of competition to employ wage labour, leading to exploitation. The necessity to foment social and socialist revolution from below, rather than chipping away at capitalism and the state through developing the co-operative sector became the principle goal of anarchism. The producer co-operatives of Mondragon are essentially structured as to ensure ‘worker control’. Worker members exercise highly limited control within each co-operative through the principle of one-member-one-vote, to a board which is elected from the membership and runs the co-operative on behalf of the members. However, it must be emphasized that it is the board that makes major production decisions on behalf of the membership meaning that members have little control over the day to day running of a co-operative in the complex. The board is thus accountable to the membership only on the basis of mandate and recall in the annual election of board members. It could be argued that there is an efficiency imperative, particularly in terms of ‘parsimonious’ or ‘pragmatic’ decision-making by the board that is necessary for a co-operative to become economically efficient in relation to the market. Therefore the imperatives of the market (technical efficiency) dictate that the board ought to make major production and administrative decisions without consulting the membership in order for the co-operative to be successful in the market. With Mondragon co-operatives being subject to fierce international competition by the mid 1980s, differing conceptions of co-operative efficiency have intensified within the co-operatives. These different conceptions of efficiency began to be reflected in a tension between the stated social objectives (democracy, participation and accountability of management) of the co-operative, and the business-like (technical efficiency, productivity, profitability) approach to management adopted as the Mondragon co-operatives started to encounter the effects of global market instability. The implications of the large scale emphasis on business-like rhetoric were threefold. Firstly, emphasis was placed on the employment of wage labourers, rather than more worker-owners. Secondly, policy-making began to occur further away from the shop floor – in specialized bodies (which was not always the case in the pre 1970s period), which left worker-owners with a choice between pre-designed business-like policy ‘alternatives’. Thirdly, an increase in joint ventures with private firms was experienced, including in some cases buyouts by the private sector and international investment in non co-operative firms. Market pressures have engendered a situation in which direct democracy has been sacrificed for market efficiency, and the range of possible policy alternatives has been limited at the highest level of the complex to exclude any prescriptions that are not in line with the profitability and efficiency imperatives of the complex as a whole. In Proudhon’s understanding, it could be suggested that the Mondragon co-operatives could have formed part of the ‘non-capitalist’ sector in Spain. They therefore could be seen to be chipping away at the capitalist sector by building on year-on-year market successes from the late 1940’s onward. However, the theory falls short of understanding how the co-operatives complex has come under real pressure from the relatively re-integrated global market competition from the 1980’s. Facing the spectre of monopoly capital and neoliberal restructuring on the part of the state, internal restructuring and ‘rationalisation’ of co-operative management toward market incentives (i.e. hierarchical decision making, profitability at all costs), means that the complex began to resemble more ‘traditional’ capitalist firms, echoing Bakunin’s warning of the pitfalls of developing an alleged non capitalist sector within capitalism. Yugoslavia took a very different route towards ‘actually existing’ socialism as practiced in the Soviet Union. Marshal Tito, the leader of the Yugoslavian Communist Party, broke with the Cominform in 1949. This break manifested itself in the deliberate weakening, (as opposed to a Soviet-style strengthening) of the state, in which ‘development’ and the ‘emancipation of the masses’ was envisaged, by decentralising economic and political power. Economically, decentralisation meant a retreat from strict social planning toward a market economy with worker self-management in the factories through co-operatives. Worker self-management was to be achieved through ‘indicative’ rather than the sort of top-down, directive planning of the Bolsheviks in the Soviet Union. Indicative planning consisted of drawing up national economic plans from reports of local self-managed institutions, established on the basis of worker council delegate’s consensus. The role of the state was to support the development of industrial firms through the provision of funding. In terms of ownership then, all firms allegedly were ‘owned’ under the ideal of de jure ‘community ownership’, though de facto, ownership in fact occurred through the state. Under ‘community ownership’, worker self-management was premised on the idea that the producers themselves should have genuine control over the means of production, meaning that they should have genuine control over the surplus that they generate. Webster goes on to highlight some of the contradictions of worker self -management in Yugoslavia. Firstly, he suggests that because income distribution occurred on the principle of each according to his work, more skilled and harder working workers earned up to five times higher than the lowest paid factory worker. Secondly, because the council decided how to distribute the firm’s profit, it usually went toward members’ wages, which lead to overall inflation as money was borrowed – rather than surplus being reinvested into the firm. Thirdly, the workers did not have any long-term interest in the survival of the company because they were not shareholders. Fourth, workers did not all have a desire to participate in time-consuming decision-making processes of the councils. Fifth, and very importantly, high levels of unemployment (30% in the 1960s) were experienced – caused primarily by a lack of incentive on the part of the firm to distribute a fixed amount of profit in the short-term among larger pool of workers, thus meaning that the incentive to absorb as much labour as possible was non-existent. The implication of these contradictions for efficiency and democracy was that neither were genuinely achieved, leading to a situation in the 70s in which mass unemployment, massive international debt, declining real wages, triple digit inflation and ethnic conflict were rife. Coupled with a reintegration of the Yugoslavian economy into the global economy following the period of glasnost, the imperatives of ‘democratic’ (read technically inefficient) production was necessarily unable to compete internationally, leading eventually to a neoliberal transformation from above in Yugoslavia. In Yugoslavia, the state’s provision of funding for the co-operatives, and indirect control of production through state representatives under the guise of indicative planning on the part of the state, had the effect of tying the co-operatives to the state. In Bakunin’s schema, the tying of the the mir to the tsar that occurred in practice on the one hand (that is, the forming a relationship of dependency between the co-operatives and the state as the ultimate guarantor of success and essentially existence), and its being controlled through indicative planning by the state on the other, essentially played out in the co-operative production process in Yugoslavia as well. The concern over the tendency for the state to be understood as the ultimate guarantor for the existence and success of the co-operative – as described by Bakunin – is therefore real and important. When the spectre of neoliberal restructuring arose in the 1980’s, funding for the co-operatives in Yugoslavia dried up, and, facing international competition, the co-operatives could not cope, leading to their eventual privatisation or closure. 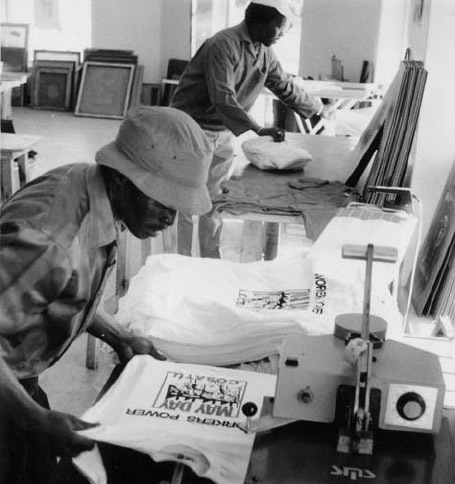 In both pre- and post-Apartheid South Africa there have been noteworthy attempts by laid-off workers to establish worker co-operatives – which must be appreciated as important experiments in self-management and worker control. In the 1980’s for example, after the dismissal of thousands of MAWU workers in the wake of a the strike for recognition at BRT-Sarmcol in Howick in May 1985, workers formed a number of co-operatives, one of which was the Sarmcol Workers Co-operative (SAWCO), the central activities of which included shirt silk-screening and vegetable farming, although it also envisaged a bulk food-buying project, which could be utilized to aid striking workers. More recently, a courageous attempt was made by workers at the Mineline-TAP factory near Krugersdorp to transform the newly-liquidated and long-occupied factory into a worker-controlled co-operative (See Zabalaza Journal No. 11 for more on this). However the most co-operatives in the post-Apartheid era have been state-initiated, such as those brought into existence as part of the Ekurhuleni Metropolitan Municipality’s ‘Industrial Hives Programme’, just east of Johannesburg, an initiative designed to provide support for and promote the development of co-operatives and other SMEs. Most worker co-operatives in post-apartheid South Africa, however dedicated the co-operative members and stakeholders in co-operative development processes (Trade unions, NGOs, communities and the state), have been unable to become successful in terms of the market and simultaneously maintain radically democratic member control. Most co-operatives then have faced high levels of degeneration from their initial goals, those of market success-paying their membership a living wage- and internal democracy. Worker co-operatives in the post apartheid dispensation should be understood to be survivalist in that they are often only able to pay their members a marginal wage at irregular intervals, due to their often marginal presence in the market. Members often have to find alternative sources of employment or rely on family and community networks to support themselves. The worker co-operatives set up by the Ekurhuleni Metropolitan Municipality in 2003 are no exception to the survivalist impulse. Although funding and training has been provided to these co-operatives by the local and provincial state, the survivalist tendency existing within Ekurhuleni co-operatives puts economic survival issues ahead of any other considerations, in particular those of democratic decision-making and worker control. This is not to suggest that these ‘democratic’ considerations are not important issues in the co-operatives (strong democratic tendencies exist in some cases), but the co-operatives have generally been unable to successfully sustain their presence in the market, or, in other cases, where managerial prerogative has emerged to make decisions expediently. Rather, the survivalist mode of existence, that is, how members were going to pay themselves a wage (and, hopefully, enter the market in a sustained way) is of chief importance, being ranked as a much more pressing issue in the co-operatives, above those of maintaining a stable membership and democratically controlling the management and labour processes. Above all, however, asking the state for production contracts has become the chief concern for the Ekurhuleni co-operatives that are still in existence. Bakunin’s observation-based theoretical position on the relationship between co-operatives and the state and co-operatives and co-operators in Russia has much synergy with the possible relationship, based on receiving and handing out contracts, between the local (provincial and/or national) state and the state sponsored worker co-operatives under study here. This can be shown in three main ways. Firstly, the co-operatives under study have not been able to penetrate their respective local economies in any sustained or meaningful way because of competition from smaller producers and retailers, and brand and price sensitivity; hence the desire for state contracts as a way out of the current state of unprofitability. Secondly, the handing out of contracts to these state sponsored co-operatives on a continuous basis would set up a relationship of dependency and patronage of the co-operative to the state, with the co-operative understanding the state to be its ultimate guarantor of success- co-operators already believe they are dependent on the state, it was the state that set up the co-operatives in the first place. There is no reason to believe that if the co-operatives under study were to build up enough surpluses to begin production with a view to competing in the market, that this would be successful in the long run. It may be that the co-operative would ask the state for more contracts in order to survive. Thirdly, the individual co-operators that have remained with the co-operative are essentially tied to the co-operative because, a) it is able to pay them a meagre wage very sporadically (often their only source of income), and they feel obliged to see the project through to success, and b) in the context of structural unemployment in Ekurhuleni, co-operators have no choice other than to remain with the co-operative: they are dependent on it for their own survival. Worker co-operatives are not free from the pressures of competition with monopoly capital, in fact, contra Proudhon and his followers, worker co-operatives are even more vulnerable to the vicissitudes of competition, often due to their lack of access to resources with which to build competitive advantages to capitalist enterprises. Co-operatives sponsored by the state, as was the case in the former Yugoslavia and indeed in Ekurhuleni currently, while offering the possibility of startup capital and relative protection from the market, engender dependency on the state, and subject the co-operative’s autonomy to the whims of state managers. Although one might argue that in the future anarchist co-operative production would form the basis of all production, this cannot be meaningfully built in the context of the state, capitalism and the market. While the co-operative form might provide a prefigurative example of how production ought to be run in an anarchist society, this cannot make a meaningful and sustained contribution to the emancipation of the popular classes now. The intended purpose of Cominform was to coordinate actions between Communist parties under Soviet direction. The Cominform thus encouraged unity of Communist parties, communist party rule and the ideas and imperatives emanation from the Russian Communist Party. Official Soviet policy introduced by Mikhail Gorbachev in 1985, intended (it was claimed) to increase transparency and openness in government. It involved increasing freedom of the press, but was part of a greater process of transformation and was used in tandem with economic liberalization and the introduction of neoliberal reforms.